Kids love to play games. Parents love their kids to play games that actually teach something. 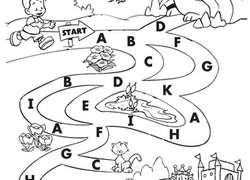 Our maze worksheets are sure to keep both sides happy. Creatively designed and colorfully illustrated, these worksheets take students on cool adventures that will test their logical-reasoning and trial-and-error abilities, while entertaining them at the same time. Some of the mazes even incorporate a maths component, so students can hone multiple skills at once. Looking for a fun challenge for your child? 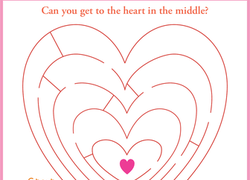 A Valentine's Day maze may be the trick. 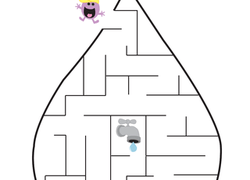 Help your child avoid thesick germs this winter by having her practise her evasion tactics on this cute maze. This penguin is waddling but he wants to swim! Help him find the hole in the ice. 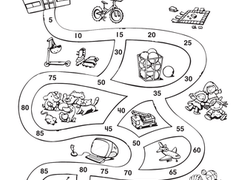 This maze is excellent practise in recognizing shapes for kids.